Ch. Puygueraud has been on my go-to Bordeaux list for as long as I have had a go-to list. It is well grown and well made under the direction of one of the right bank’s best estate managers – Nicolas Thienpont. It tastes like what it is and where it’s from and there is no hint of over-manipulation or over-extraction or over-pricing. Instead, Ch. Puygueraud is solid and reliable and comforting all the while serving as a reference standard for right bank reds in a certain price range. If the appellation were fancier, the wine – exactly as it is – would sell for a lot more. The chateau and its vineyards are located on the eastern edge of the Cotes de Francs (a Right Bank appellation which is itself located on the eastern edge the whole of Bordeaux). The soils are clay over limestone. Everything is done right but there is no fussiness. A 14.5% alcohol blend of 70% Merlot, 25% Cabernet Franc, and 5% Malbec fermented using pump-over in temperature controlled stainless steel tanks and aged 14 months in French oak barrels (40% new). Deep purple in color with well formed legs; dry, medium-full-bodied with freshly balanced acidity and medium plus phenolics. Juicy, lively, mostly black fruit with a limestone terroir note; supple dusty oak and accents of black pepper, black flowers, red flowers, cocoa, and dark spice. Long finish, fresh, alive-in-the-mouth, complete. It might repay some keeping (3 or so more years) but why would you? It is delicious now. BS: 91. 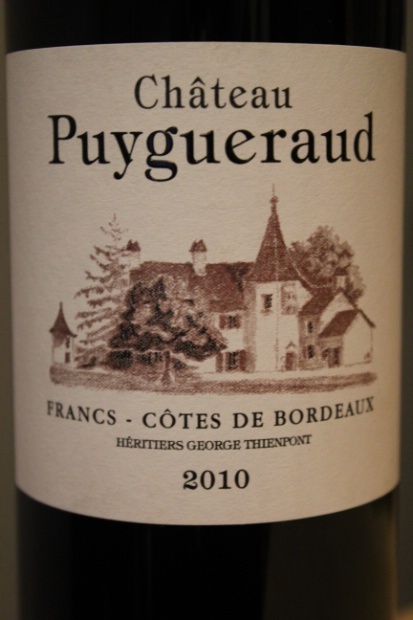 This entry was posted in Bordeaux, What I'm Drinking, Wine of the Week and tagged Francs, Puygueraud, Thienpont. Bookmark the permalink.